Courtship can be messy, even for future presidents. And while we often lament the loss of those days when youthful indiscretions were kept undocumented, the letters of the pre-technology era can offer a similarly cringeworthy window into the embarrassments of our forefathers. Case in point: Abraham Lincoln. But as often happens with matchmaking, things quickly went from great to uncomfortable when Mary Owens did not look as Abe had remembered her. His description is best read in its full form. I knew she was oversize, but she now appeared a fair match for Falstaff. I knew she was called an “old maid,” and I felt no doubt of the truth of at least half of the appellation, but now, when I beheld her, I could not for my life avoid thinking of my mother; and this, not from withered features—for her skin was too full of fat to permit of its contracting into wrinkles—but from her want of teeth, weather-beaten appearance in general, and from a kind of notion that ran in my head that nothing could have commenced at the size of infancy and reached her present bulk in less than thirty five or forty years. In other words, he was not pleased, but being the gent that he was (and yes, that’s up for argument), Lincoln did the proper thing and went through with his agreement to date and potentially marry a woman he now reasoned to be one “that no other man on earth would have.” In doing so, he tells his friend Mrs. Orville H. Browning—the wife of a fellow member of the Legislature—that he resolved to look for Mary’s positive attributes. He concluded that she had the finest face despite her weight. Plus, he writes, she was smart, which was a higher value trait. Lincoln would become engaged to 21-year-old Mary Ann Todd two years after his proposal to Ms. Owens, but his relationship troubles didn't quite end there. 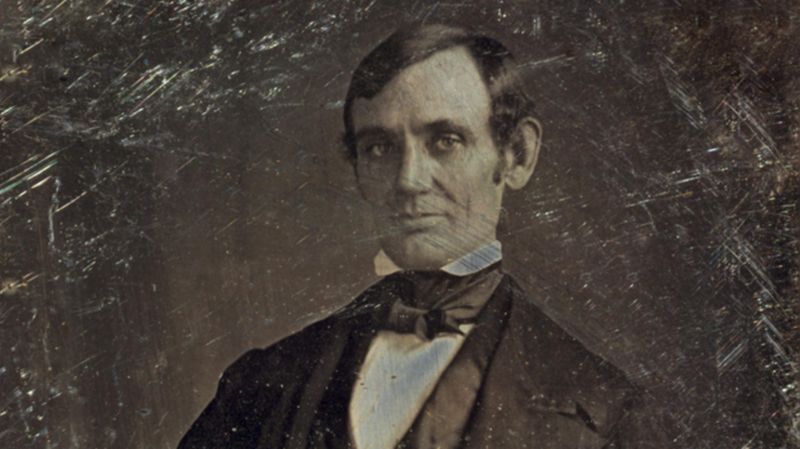 Lincoln broke off the engagement to Mary Todd at one point, saying he felt unworthy of her, but the pair reconciled in 1842 and were together until his death in 1865. To read the entire letter confirming that Abraham Lincoln was kinda just the bad ex-boyfriend in a romantic comedy, hop over to Lapham’s Quarterly.